Property Inspector is essential part of modern IDE and application builder tools becoming a common unit of professional user interface. Such approach reduces significantly (if not completely) number of dialogs in an application, making application user interface modern and consistent. From the development perspective usage of Property Inspector minimizes greatly time of development and code size. All you need is to write the beans responsible for application logic and possibly some custom editors. Property Inspector is a component designed for displaying and editing of properties of the bean. "Classic" Property Inspector consists of 2 columns: first column displays property names; second column displays property values. Property Inspector exploring BarChart bean. Simple properties - as a rule value type of simple property is String or simple Java type: boolean, byte, char, short, int, long, float or double. In the picture above title, orientation and autoLayout are examples of simple properties. Array properties - value of such property is an array. Simple or composite property is associated with each array item value. In the picture above columns is array property, and composite property is associated with each array item. Composite properties. Value of composite property is another bean, characterized by its own set of properties. 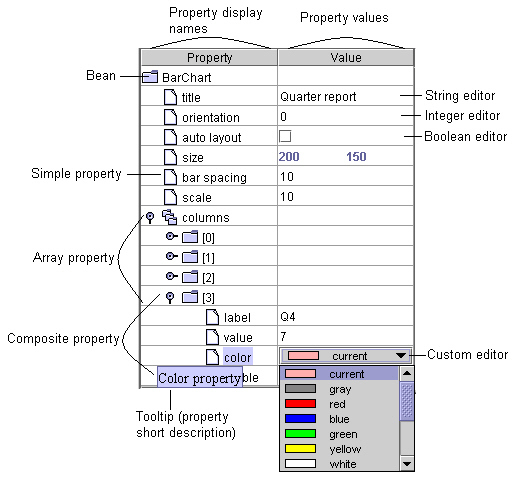 Bean properties can form a hierarchy, represented in Property Inspector as a tree. In the example above BarChart bean has array property columns. Array items presented by composite properties consisting from 4 simple properties: label, value, color and visible. Property editor is used to display and edit the value of the property. For each value type a specialized editor is required. BeanExplorer comes pre-equipped with editors for all simple Java types (boolean, byte, char, short, int, long, float and double), as well as for more frequently used types like String, Dimension, Color and Font (see the picture above). Property Inspector itself is a bean that can be easily embedded in any Java application. The example below demonstrates sample application (see the complete code given below). 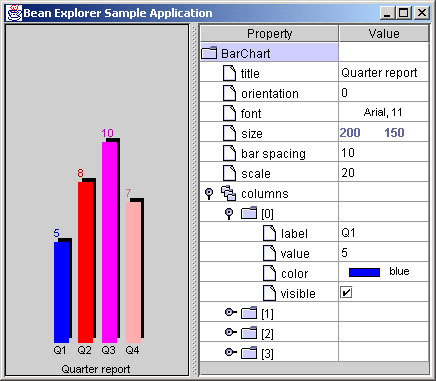 The left pane contains a bean (BarChart), the right pane contains Property Inspector that manipulates properties of the bean. BeanExplorerTM can be purchased from our company online.